Recently installed this TOCE exhaust and mid pipe, as well as all other bundle items onto my 2018 CBR600rr. Fitment is perfect, and installation was a breeze with the provided videos TST offers. This exhaust sounds just as amazing as it looks! If your debating whether or not to pull the plug on purchasing one of these, pull the trigger! You will not be disappointed. 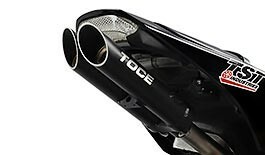 I finally received my toce t exhaust from tst industries and I’m in love with it. All the videos I watched and reviews I read are right on point.. the videos that tst provides are also a big help on how to install.. just want to say thank you and that I’m a very satisfied customer. I will be definitely making more purchases in the future with tst. I will recommend them to everyone. This exhaust is amazing. Fitment is perfect. Quality is top notch. I installed this on a 2016 cbr600rr. I couldn't be happier. This exhaust sounds insane, videos dont do this justice. Advantages: Easy installation. All parts are great quality. When I removed the OEM pipe I found it made it easier to remove when I took off the undertail heatshield.